Does Scottrade Have Hidden Fees? Scottrade has no hidden fees when it comes to buying and selling stocks, ETFs, or options. As a customer, you are able to enjoy other great services and tools that are also totally free. 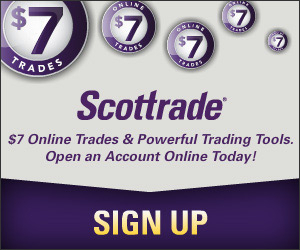 Use promo code KGKP0724 to open a Scottrade brokerage account, receive 3 commission free trades, and experience the broker first hand. I have been trading stocks with Scottrade for more than 10 years. Over the same period of time, I have opened a number of stock brokerage accounts at different firms and tried different things with each of them, but at the end, Socttrade remains the broker I use. The reason for being a loyal customer for so long is more than the cost of trading with Scottrade. Actually, Scottrade doesn’t have the lowest commission fees among brokerage companies I have an account with. It’s stock trading fee is rather high at $7 per online trade. I like Scottrade because its excellent customer service, comprehensive research tools, flexible account funding options, and, of course, no hidden fees. Choosing a stock broker with the least fees is always one of the top considerations when evaluating brokers that all have very competitive pricing and offer different sets of research, education and trading tools. For me, even though I don’t trade a lot and saving one or two dollars per trade doesn’t always seem to be appealing, every dollar I pay to the broker for other activities outside trading adds up and eventually will erode my return over the long term. At Scottrade, what I do most often, not surprisingly, are transferring funds and trading stocks and I don’t see additional cost for using some of its most convenient tools. For example, the one that I used the most, which is also the one I like the most, is Scottrade Money Direct. With other brokers, there’s always a period of time that I have to wait until the fund I added becomes eligible for trading, some places 3 business days, some even longer. But that’s not the case at Scottrade. With the Money Direct, I can make deposit at any time, even in the middle of the trading day, and the money will be available for me to buy stocks minutes later. There’s no days of waiting for the money to settle. This is the kind of service that I don’t find at other brokers and keeps my business with the firm. The above is just an example of the services you will get from Scottrade as a customer without extra fee. As for Scottrade commissions and fees, they are not the cheapest among discount stock brokers as I mentioned early, but the fees are clearly listed, so you will not be surprised when doing business with them. Since I do almost all my transactions online and rarely require anything physical delivered to me, I haven’t encountered any hidden fees as a customer for more than 10 years. Of course, it’s always a good practice to review broker commissions and fee schedule before deciding which one to use and there’s no exception for Scottrade. To find out what and how much you will be paying for services at Scottrade, go to Scottrade website and under the Fees & Commissions section, you will see all the fees involved in trading with Scottrade. I was seeking help for a low cost trading account to manage my investment. This is an awesome review.